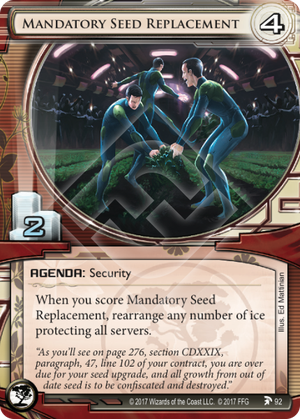 "As you'll see on page 276, section CDXXIX, paragraph 47, line 102 of your contract, you are overdue for your seed upgrade, and all growth from out of date seed is to be confiscated and destroyed." When the Corp scores Mandatory Seed Replacement, can they change the number of ice protecting a server or create new servers with the available ice? No. The same amount of ice must be protecting each server after the rearrangement as before, and thus no new servers can be created through the rearrangement. This feels like a card to optimize your positional ice placement mid-game. So let's first look at positional ice. FFG hasn't provided us with a nice positional subtype so we'll have to do this the old fashioned way, by searching in the text field of cards. Apologies in advance if I miss a card. That's 1 , 2 , 3 and 6 . Disregarding the ice that will rotate soon we get 1 , 2 , 2 and 3 . Once rotation hits that's 8 pieces of positional ice of which 3 in-faction for Jinteki. And these three (Chum, Inazuma, Lockdown) are unlikely to ever fire their subs aside from the early game. When properly positioned though they have good cost-to-break / cost-to-rez ratio. Ok, so what else can we do with Mandatory Seed Replacement? It's good for undoing Escher and Inversificator (though Inversificator will soon mess things up again afterwards). You can reorganize your ice with it to protect the most heavy hit server, but really you should know which ones will be heavily hit at the time you place the ice. And how about the competition? Are there better 4/2's for Jinteki? Nisei MK II (extremely powerful against run event based deep digs and assaults on scoring servers), Corporate Sales Team (10), House of Knives (death by a thousand paper cuts), Medical Breakthrough (next one is easier to score, even when stolen). Mandatory Seed Replacement has some stiff competition and its not holding up well against them. To sum this review up: nope.